Ever since I first visited The Big Apple back in 2001, I've loved being in the city. My husband and I always take a short trip every year to visit friends and to just enjoy the city. And every time I go I always say that even though I love it, I could never live there. Well, I'm singing a different tune this time around. I could DEFINITELY live there. It's just got this energy that makes you feel like you could do anything or be anyone you want to be. The trip was great and I got to explore different parts of the city that we've missed out on in the past. We didn't get a chance to hit up Brooklyn because of time constraints but that will not be forgotten next time we go (possibly next month, fingers crossed). Unfortunately, I was a tad lazy this time around and did not take many photos at all! I think it was because I was so overwhelmed with everything that taking pics took a back seat this time. That doesn't mean that we didn't take ANY photos, just not many at all. 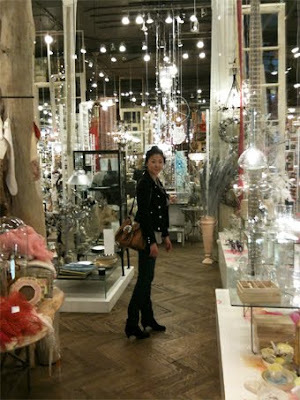 One of the stores that I knew I HAD to check out literally blew me away! The website was enticing but I had no idea what I was in for when we got there. I knew the minute we were walking up the steps to the door that I would not want to leave EVER. And boy was I right. It was like heaven on earth for me. Okay, that doesn't really describe it at all. 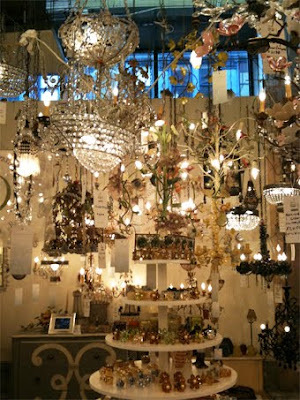 Imagine Anthropologie (my favorite store) for the home but with a more delicate, whimsical twist. That's what it was like and it was just pure paradise. Oh right, I'm talking about ABC Home of course! The prices, however, brought me back down to earth which I hate when that happens. But I was able to get some really beautiful glasses. 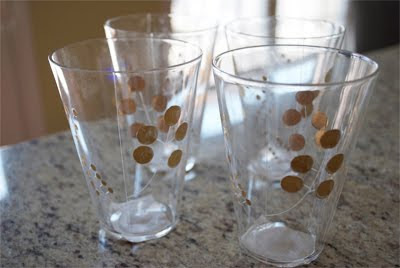 Etched Glasses with Gold Designs for $15 each. And to help you get a better idea of what the store looks like on the inside, here are some snapshots of me having a dandy 'ol time. 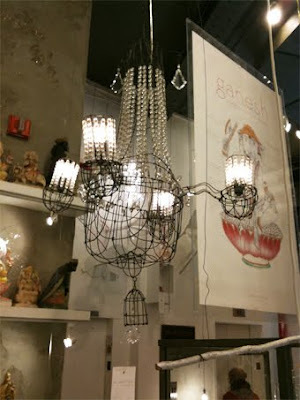 This was in the main chandelier/lighting section. I was checking out these gorgeous mini tiaras they had. I was tempted to put it on but (1) they were way too small and (2) my husband told me I shouldn't. I thought he was raining on my parade, but I think he was right in the end. I would've looked a bit crazy doing that. Steve really liked this one for our bedroom and then looked at the price tag and almost had a heart attack! Just try to guess how much this bad boy is? I bet you won't get anywhere close to what you think it costs. Okay, I'll just tell you. $5,300! Guess if you've got the money, why not? But I definitely do NOT have that kind of money for a chandelier, so we'll just have to wait on that one until we win the lottery or something. Okay, so those glasses from ABC were a great find, BUT the steal of the day or really steal of the century is the oil painting Steve found when we chanced upon the West Village Thrift Shop (Housing Works). I'm a big fan of thrift stores (don't be a snob, thrift stores are awesome). I could spend hours in a thrift store. It's like a treasure hunt. 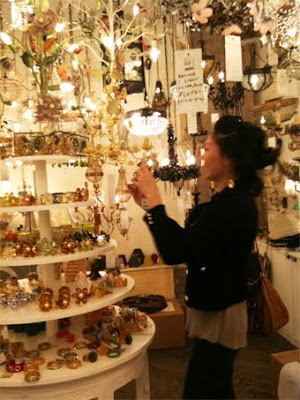 So yea, we went in and split up - Steve went towards the artwork and I went towards the home wares and leather jackets. 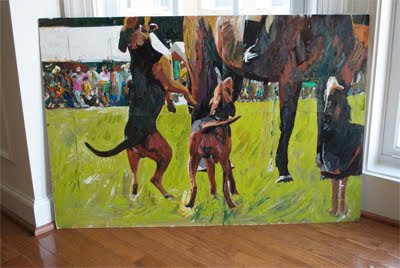 Well, he found this incredible oil painting of dogs at a polo match for, get this, $25!!! He bought it within 2 minutes of finding it. Smart man, that's why I married him. Just a little info on Housing Works since it's an organization that is really giving back to the community. "Housing Works is committed to ending the twin crises of AIDS and homelessness. We believe that all people have the right to a rich and empowering life. Since 1990, we have provided the highest quality services for homeless men, women, and children living with HIV and AIDS in New York City and beyond. Housing Works is the largest community-based AIDS service organization in the United States, as well as the nation’s largest minority-controlled AIDS service organization. Since our founding in 1990, we have provided lifesaving services, such as housing, medical and mental health care, meals, job training, drug treatment, HIV prevention education, and social support to more than 20,000 homeless and low-income New Yorkers living with HIV and AIDS." I had read about it a few weeks ago and told myself that I should check out one of their thrift stores and of course being me (I'm quite forgetful) I forgot. So I was thrilled when we walked by it and decided to go in. If everything goes well, we might take another trip up there next month so hopefully we'll take more pictures to share with you all.